"Cruz has much more to celebrate than just a debut as a leader. With formidable power, sonic richness and utter grace going for it, Milestone is as deeply satisfying a set of contemporary jazz as I've heard this year". 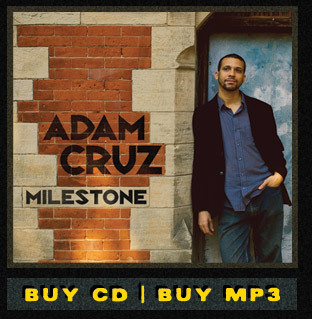 "Milestone is a rollicking and rewarding record that proves sometimes good things are worth the wait"
"Adam Cruz is a drummer's drummer and a melody's dream; someone who knows how to use the foundations of rhythm with which he has been charged to anchor and illuminate his compositions and collaborators, arranging as though anything less would be uncivilized"
"Adam Cruz is the classic drummer bandleader, in the tradition of Philly Joe Jones and Elvin Jones, who knows how to stoke the fire from the proverbial engine room,but he’s gone the extra mile on Milestone in crafting quite a solid compositional woodpile of original music." "From a purely compositional standpoint Cruz is a beast; especially considering this is a debut album"
"Dynamite... This is music that is potent, high-octane and excitingly full of tension and release without ever once losing the coherence and the identity of each individual soloist. This is an integrated band." No upcoming events are current scheduled. Please check back!